square shallow bowl with an SP mark on the base red oxide? Re: square shallow bowl with an SP mark on the base red oxide? Not Maltby. Everything is wrong.The glaze is really not much like anything at all within John Maltby's canon . Too bright, too strong, too glossy. The SP mark is just nothing much anything like his Stoneshill mark, part from being a capital SP. It looks very similar to one of Maltby’s Stoneshill Pottery mark but i agree with Philpot that everything else about it is wrong; the mark would have been on his standard ware, and he would have included an M if it was his Art pottery. It might be Michael Cartwright’s Spike Pottery but I haven’t seen enough of his work for comparison; the mark was only used for a short period. Many thanks for the comments - didn't think it was Maltby myself as it is so disimilar. I'm sure I've seen similar work before but can't place it atm. The mark is right (ofc this proves little), the clay looks about right (though he did use many), the age would seem right and the style/decoration I could see Maltby doing (his variation was huge and he did seem to like vague cross shapes/4 parts). philpot wrote: The SP mark is just nothing much anything like his Stoneshill mark, part from being a capital SP. I've seen both this and the more angular SP mark used own their own on pieces that I was certain were from Stoneshill. 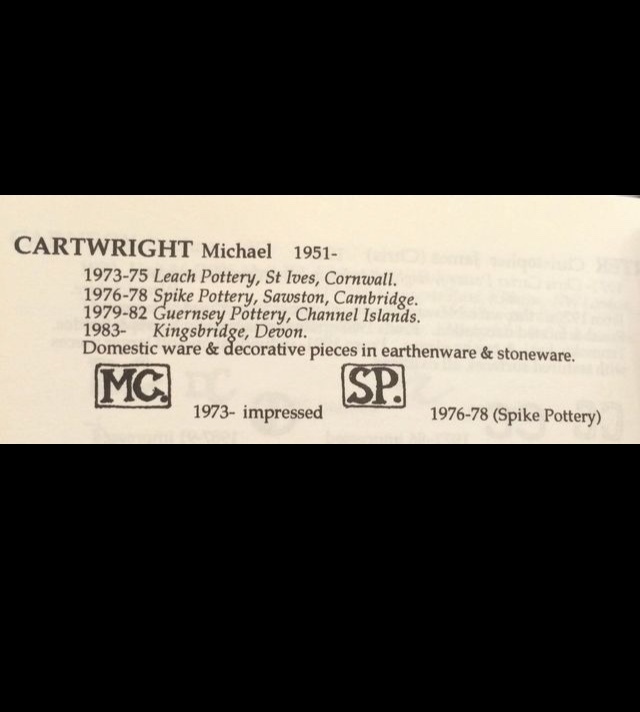 With regards to Michael Cartwright I've no idea what his work or actual mark is like, the SP font used appears to be the same in "the book", but I've found that book to be very unreliable when it comes to the finer details, but you could well be right. Potty wrote: I've seen both this and the more angular SP mark used own their own on pieces that I was certain were from Stoneshill. I can't add anything with any confidence except to say I wouldn't rule anything out. studio-pots wrote: I can't add anything with any confidence except to say I wouldn't rule anything out. The glazing and form look more like A Frith Brookhouse pottery piece. 'I’m somewhat embarrassed to admit I’m very hazy about this pot. The stamp is identical to the Spike Pottery mark and I don’t think I added a personal monogram as I was the only potter. I remember making slab form dishes without a mould, just free-formed over a square block of wood but I thought that was at art school, not later. I have fairly comprehensive references but can find no other similar marks and the pot is exactly the sort of work I made inspired by Hamada slab dishes. I said that: The only other SP mark in question was Stoneshill Pottery with some question over whether it might be by Maltby. and there is an SP stamp that looks very similar to Stoneshill Pottery so it can’t be ruled out. My instinct is that it is a Maltby pot. I can’t quite get my head around the abstract wax resist motifs, just doesn’t ring any bells with me. Oh well, the mystery remains! No objection to sharing comments. Interesting. I’ll ask a friend who knows Maltby well. He might get a chance to ask the man himself. Is there such a thing as just too much fan intrusion? This was produced when John Maltby was round about 40. He is now well into his 80's and retired from potting. We have our heroes and respect them. Surely part of that respect, is of their privacy? We will have to disagree on this one. Personally I would regard its as an impertinent intrusion. Well don't ask don't get. Nothing wrong in my book in asking politely. I'm assuming you are guessing pp when you say he may think it an intrusion? Yes he might but conversely he may love to see something from his past hat he has not seen in many, many years - it may bring back good memories. Since this was never ever going to be a Maltby piece. Wrong in every way. Personally I belong to the old school. Before the internet made privacy a non-existent thing, and gave everybody seemingly the God-given right to think they can intrude on everyone anytime! Well I get intrusions on my privacy every day, my inbox is full of them .....delete, delete, delete.... no worries. I don't lose any sleep over it. I would be surprised if anyone did. Well it wouldn’t be me asking. I’ve passed the photos to someone who’s a friend and sees him regularly. If he sees it as an intrusion, or not a Maltby so not worth asking, then that’s his decision. But there are many ‘car boot’ collectors who have no qualms about contacting all and sundry. If the potter doesn’t want to respond then they won’t .